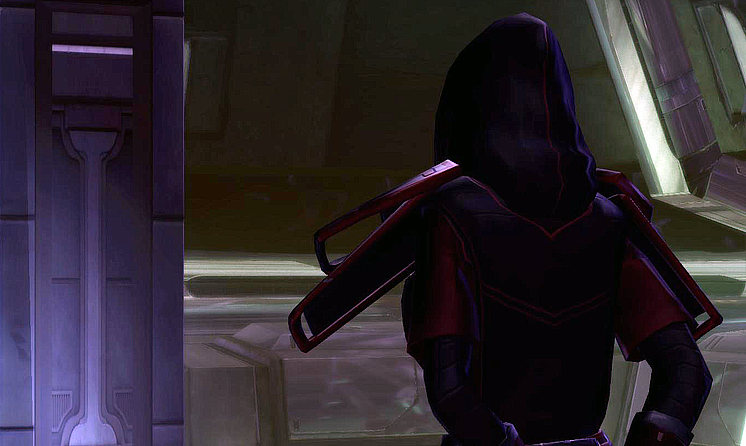 Warning: This post contains spoilers for the prologue of the Sith Inquisitor storyline in Star Wars: The Old Republic. To see a spoiler-free summary of the storyline please check this page instead. Welcome to my new series, where I look back, review, discuss, joke about and rip apart the different class story lines in the Old Republic. For the WoW readers who haven’t messed around with TOR, allow me to explain. Throughout the leveling game in TOR, you have several types of stories. There are one shot mission stories, overall stories for each world you visit and there are your class storylines. The first two are things that everyone does. They have a little extra flair here and there that are tossed in for your class. Usually in the way of some changed lines of dialogue or unique choices on the dialogue wheel. The latter on the other hand is the exclusive storyline of your class only. It’s what makes playing the game 8 different times worth while. Now which class stories shine and which crash and burn? Well that’s what this here series is about. I’m going to go through each class as I level them, break down the stories of the prologue and three acts, and then write about what I think their strengths and weaknesses are. I hope you enjoy! First up is the inquisitor. 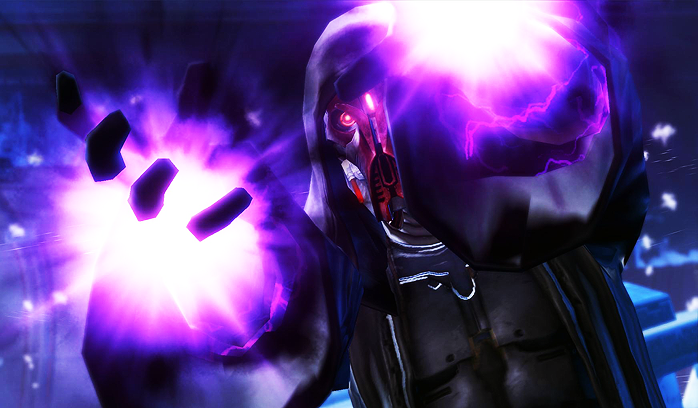 The Sith inquisitor was one of the first classes I really latched on to as a concept. For me it wasn’t necessarily the ability to shoot lightning as much as it was the idea of a secretive, scheming Sith who liked to play chess master all over the galaxy. Yes, I dreamed of manipulating my foes, setting traps, and executing masterful Xanatos and Batman gambits. What I did not dream of was blindly stumbling into my station in life while working for someone who does all that. /sigh. 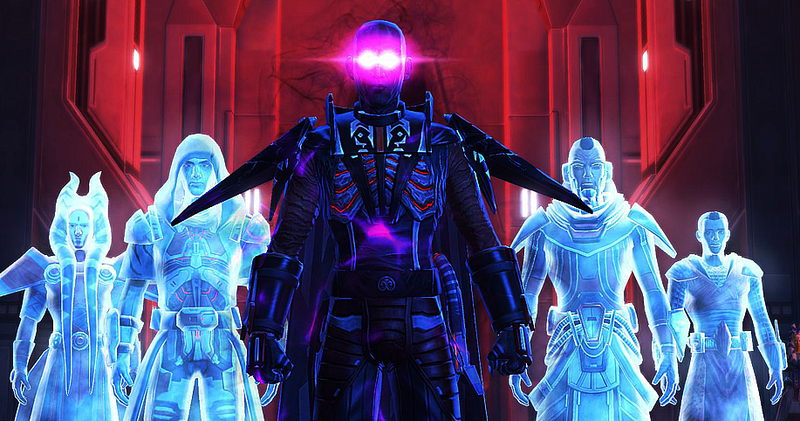 Welcome to the world of the Sith inquisitor. After your opening crawl, you will find yourself on the ancestral territory of the Sith, Korriban. Where you are quickly brought in and abused by your overseer. You are a slave, and not exactly well-respected by the Empire, and doubly so if you are any race other than human or a Sith pureblood. Actually, I’ve played through this entire world a few times. All as different races. The interesting thing I noticed is the number of conversations on Korriban and to a lesser extent Dromund Kaas that actually change depending on if you are an alien or not. Oh, you’re treated like dirt no matter what. Even if you are a distinguished Sith pureblood, which are normally held up as measuring stick to all others. I’ve often wondered exactly how a Sith pureblood would end up in slavery. My first inquisitor I had constructed a lavish back story that mirrored the Count of Monte Christo. A betrayed pureblood was exiled and captured by slavers after being framed by a rival. Seemed plausible enough. The general storyline of Korriban is that you and a bunch of other slaves are being tossed into the Sith academy in an attempt to weed out one individual to become the new apprentice of Lord Zash. You’re put through trials by Overseer Harkun, who seems to be passionately rooting for a Sith pureblood named Pfon to win the prize. It’s been commented a dozen times across the web that there may be something to Harkun’s almost idolatrous fawning over Pfon. Some have read potential sexual undertones to the whole thing. I honestly just saw as a fanatic worship of the pure blood, something the Sith seem to have going for them. At least on Korriban. (This theory is extremely weird and hard to believe if you are leveling a Sith pureblood however. Might just wanna go with the sexual idea. Why not?) I haven’t seen it turn up much anywhere else so far. Needless to say, Harkun is quick to praise this ‘rival’ and punish you. He will routinely assign Pfon easy assignments and send you into death traps, and when you succeed he accuses you of cheating. The general idea, as explained by the crazy old Sith in the tombs during your first mission, is for you to hate Harkun and Pfon. In this regard, it absolutely succeeded. During your various trials, you eventually are met by a blonde woman in Sith robes. This is the mysterious Lord Zash. Which your character – who has never met or seen an image of Zash at this point – immediately recognizes. The only reason I knew this was because I happened to have the subtitles on during this scene. I can’t tell if I – the player – was supposed to know who this was. If I was, it’s really poorly established. She never says her name. In fact, I doubt I would have caught it without subtitles until the next conversation with Harkun when one of the dialogue options is to mention that you were chatting with your ‘future master’. Honestly, out of everything, this is probably the biggest problem with the entire Korriban segment of the storyline. Why doesn’t she just introduce herself? It would be simple! “I am Lord Zash.” There. Done. Ambiguity removed. WHY IS THIS HARD? The conclusion of your trials have you freeing a creature known as a Dashade and retrieving a star map. You are able to triumph over Pfon, who had a head start, by Lord Zash appearing and revealing the secret to freeing the monster after he had left. Finally, a lucky break for your beaten down… uh… hero? You go into the tomb and free the creature, who calls himself Khem Val. He was a servant of Tulak Hord. Which begs the question of why Tulak Hord sealed him away in the Tomb of Naga Sadow. I honestly haven’t the clue. It gave me pause originally, but in all likeliness it has more to do with the fact that once you go back a few thousand years in Star Wars history, I stop giving a damn. Of course, if Khem was IN the tomb of Tulak Hord, he probably would realize that his former master was dead, instead of sitting there waiting for him to return. The story on Korriban wraps up with you returning with the star map that Zash wanted and the Dashade following your command, as Harkun tries to pull the fast one on Lord Zash and attempts to convince her that Pfon obtained the map instead. In a move that royally ticked me off, Zash kills Pfon. Really? You couldn’t give me that? After dealing with that annoying punk for 10 levels, I have to sit there and watch my new master kill my rival? Oh whatever. If anything it gives me a reason to hate the eerily nice and cheerful Zash even more. 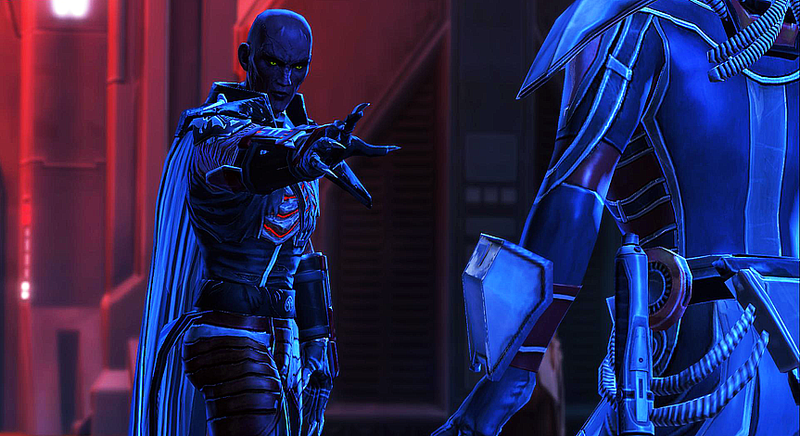 Your new master invites you up to her office, where she tells you to meet her on Dromund Kaas, hands you her old lightsaber, and you are quickly introduced via henchmen to a new rival – Darth Skotia. Have fun pronouncing that one. It’s pronounced no less than two completely different ways during the next 10 levels. Also, she just hands you a lightsaber. That’s it. Nothing else. There’s no fanfare or celebration. I know this doesn’t seem like a big thing, but that’s because this is the first one of these posts. I’ve played every force class to the point where they receive their saber, and they always have a nice dramatic cinematic for it. The Jedi use the force to assemble theirs, and the Sith warrior breaks open an ancient tomb and claims one from a dead Sith lord before battling a half dozen mummies. But the inquisitor? You get one handed to you. Zash keeps it in a drawer of her desk. I suppose there’s some sentimental value because it was HER old lightsaber. But really? That’s IT? C’mon! When you first arrive at the homeworld of the Empire, you immediately are greeted by the very Darth Skotia you had just heard about. He is a giant, mostly robot, Sith lord who gets a nice reverb to his voice that makes my cyborg characters insanely jealous. He drops a warning to you that he ‘knows what Zash is up to’, which is either foreshadowing of what is to come in act one, or old news if you are a paranoid sort who doesn’t trust Zash from the moment she called you over in Harkun’s office. You then go to meet up with your master and deliver Skotia’s vague threats. Zash immediately lets you in on the plan. Or part of it, at least. Zash needs a secret relic for her ritual and a fancy new office, so you’re going to kill Darth Megatron. Oh. Okay. Well, that was blunt. The plan to destroy the Darth is two-fold. 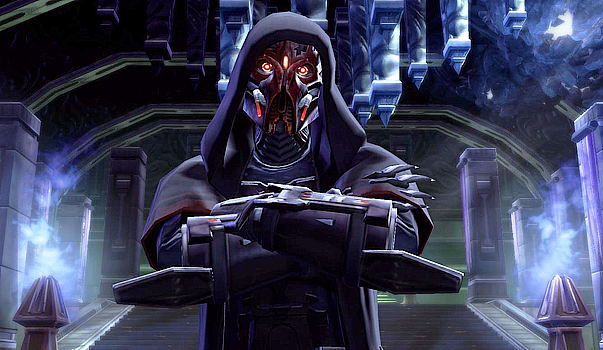 First you are sent to find an ancient tablet that will force his trandoshan bodyguards to stand down or obey. This is, of course, kept in a super secure secret facility under a mountain. It’s actually a relatively simple smash-and-grab operation, only really spruced up by the side missions you get while you are the giant mountain being carved into a statue. However this tablet will really prove to be more fun later. 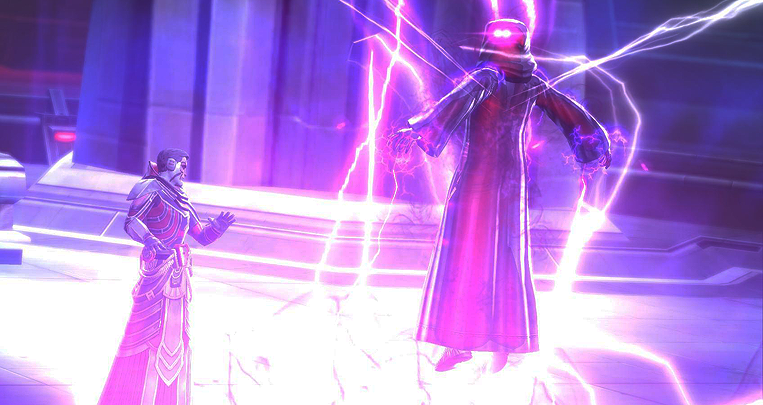 The second half of the plan is to find a scientist that is being imprisoned by the rogue Sith lord Gratham. 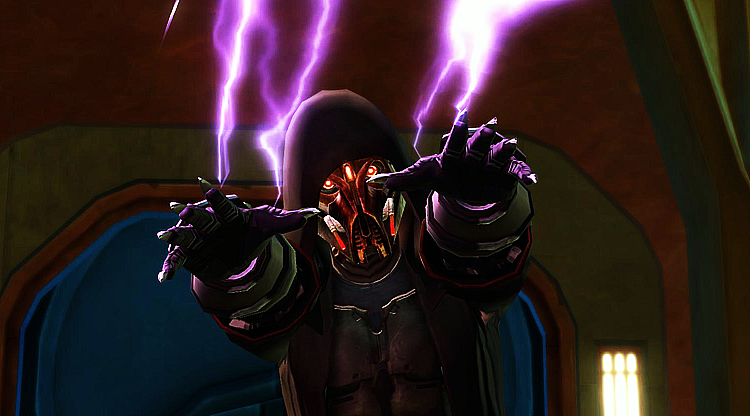 The scientist has developed a tool that will severely damage Darth Skotia’s mechanical parts. Naturally, the scientist doesn’t have it on him, so you have to go down into the lab to get it. Again, other than the choice of what to do with the scientist, this is just another smash and grab job. There’s not a ton of suspense, just you playing fetcher monkey to Zash. This actually sets a good tone because that last sentence can be used to describe about 90% of the next act of the Sith inquisitor’s story. Not that it’s dull. There’s fun to be had in the process. At least you can actually mouth off to Zash about being her gopher. I appreciated that. After you’ve retrieved the doo-hickey and the thinga-ma-bob, it is time to face off against the Darth and get the boss a promotion! Zash, being smart enough to establish an alibi, goes off to a party with some other Darths and Lords in town while you meander down the hall to find Darth Mega Man. You first get to take control of his body guards with the tablet you retrieved earlier. The choice is ordering them to stand down and leave or tell them to kill Skotia. I always chose the latter, not because Skotia has any sort of affection for them but because I like the idea of him destroying his own defenses. I’d like to think he’d learn a lesson before I kill him but I know he doesn’t. Then as soon as the fight has begun, you ‘taze him bro’ with the thing you got from the scientist and then just wail away on him. Despite being a boss level mob, he goes down pretty easy after you zap him. Now that Darth Robocop is dead, you can join Zash at the party to celebrate (or more so give Zash a reason to leave the party as she seems bored out of her mind). It’s at this point you are introduced to Darth Thanaton who has a brief and angry exchange with Zash. In a great deal of foreshadowing, Thanaton will not be relevant to you in any way until you’re in the 30’s. I really liked the fact that you get a few good looks at him early on, and establish that he doesn’t much care for Zash or her plans. You rendezvous back with Zash at her new and roomier office to find that she’s been promoted to a Darth! Nice! What do you get? A mission befitting Mystery Inc! Yay? Zash wants you to go the Dark Temple (Okay, we really need these to have better names. How many Dark Temples have I been to in my 20+ years of video games?) and pacify a ghost that is haunting the tomb with yet another relic she needs for the ritual. Finally, you get an interesting twist during one of your tasks and discover that you do not actually need to fight the ghost. Because you get to have your own Skywalker moment when the ghost appears and explains that you are his great, great, great, great, great, great-grandchild. He calls himself Lord Kallig, a rival of Tulak Hord (and a part of me always laughs at Khem Val when he mentions it), and he has come from the beyond to assist you in reclaiming your family’s once proud position. And oh boy are you going to need it. He also informs you that Zash seeks to betray you! Which isn’t exactly shocking, because both Skotia and the in-game codex have pretty much already told you that. Of course, you can happily choose to deny it. After all, Zash has been pretty cool to you since you became her apprentice, and this ghost just claims to be your grandpa and now you have to trust him? Riiiight. Dromund Kaas wraps up with the Ghost of Kallig’s warning, returning the relic from the tomb, and Zash giving you a new ship and some orders. The star map you retrieved from your last trial on Korriban has helped Zash track down the location of two more relics on Balmorra and Nar Shadaa. Which fortunately happen to be the next worlds you are within the level range to do! Pure coincidence, I am sure. And of you go on your amazing new giant, TIE fighter looking thing! For adventure! Despite my constant joking, the Sith inquisitor prologue does an amazingly good job of setting up the status quo for the class. You are introduced to several key characters, are given a solid purpose from both Zash – who explains that she has had visions of you becoming all-powerful through this mysterious ritual – and Kallig – who wants to see his family line restored to their rightful place. The idea of rituals is an important one and is established prominently from the get go with the gathering of relics and items to reinforce your power, including freeing Khem Val who becomes your first companion and bound servant. Zash is not nearly the mustache-twirler my humorous retelling would paint her to be. She is actually very good about establishing a solid level of trust with you early on. Unlike Harkun or Skotia, who treat you as some lesser being because you were a slave (even more so if you were an alien slave), Zash is kind and encouraging. The first time you meet her she calls you a slave and then quickly corrects herself by referring to you as an acolyte instead. She congratulates and compliments you on your victories, were as Harkun was quick to accuse you of cheating. She honestly seems to be the only person you ever meet that appreciates you. If I didn’t know what was to come, I’d write off Skotia’s warnings as sheer jealousy. The story does a great job of actually making you like working under Zash. That being said, there is a good amount of just being a gopher. You don’t exactly feel very important in the grand scheme of things quite yet. There are a few attempts to create a sort of “chosen one” mentality with things like shooting lightning at a holocron to get it to open which you’re told is something no one has done in thousands of years apparently. It’s fine though, a lot of class stories feel that way in the prologues. It is after all, a prologue. My real frustrations with the Inquisitor’s story don’t start to further down the line. Anyway, that’s my first entry in what I hope to be a nice full series. As always, feedback is appreciated and feel free to leave your own opinions on the story in the comments. I would love to hear them! 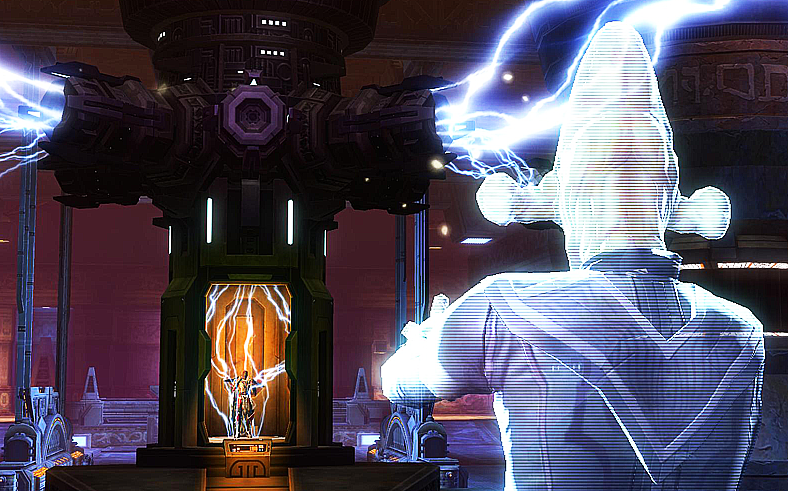 Hope you enjoy my thoughts and retrospectives on the stories of SWTOR.